I think almost everyone, supporters and non-supporters, believe the AVN is antivaccine in spite of its protests to the contrary. 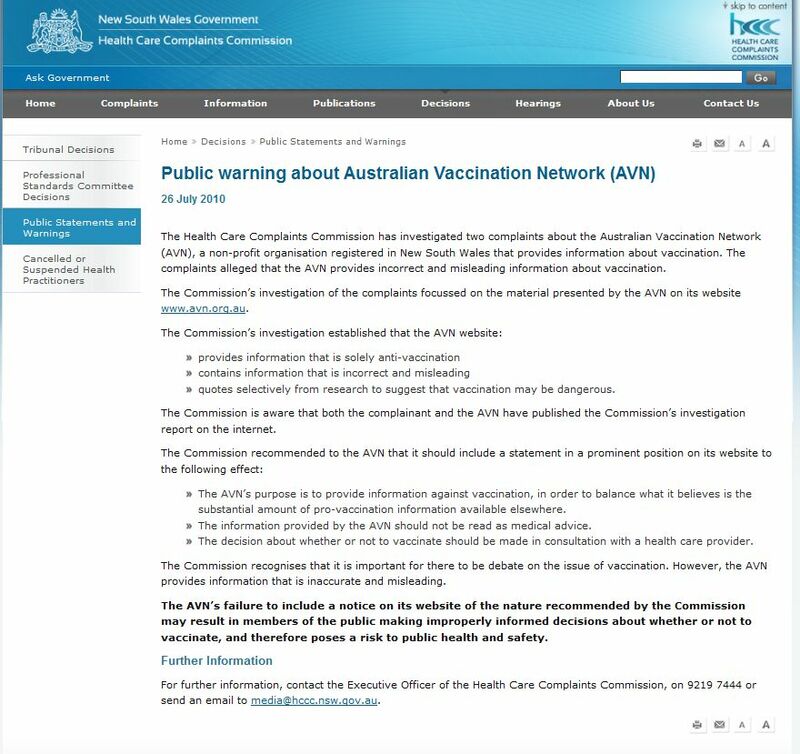 I love the info that the AVN provides so people can make an informed choice – and I want it to survive – but I can’t tut tut about them calling us anti-vaccine and I hate feeling as though I have to support the deception. I would have added “disingenuous” as well as many other terms to indicate that a deliberate ruse was at play. This entry was posted in anti-vaccination dishonesty, australian vaccination network, AVN, meryl dorey, stop the australian vaccination network and tagged anti vaccination, australian vaccination network, AVN, dishonesty, Fran Sheffield, HCCC, Homeopathy Plus, meryl dorey, TGA. Bookmark the permalink. And so begins the Great Anti-vax Schism. Fran’s also suggested Dorey display something to the effect the AVN provides non government information (ie: the other side). So in effect it sounds like Fran is suggesting this “victory” doesn’t undo the damage Meryl has done in maintaining dishonesty and she should have just complied initially. “Hi Fran… I think what you wrote is refreshingly honest. I think that once you have discovered what vaccines really are it would be hard to be prochoice….”. Which would mean the original contention was based on complaints not denial of being a health care provider. More dishonesty. Poor Fran. Chuck it on the “rewriting history” pile. I and many others have misread the judgement. To put matters straight. The Court ruled that the HCCC should not have instigated an investigation based on my complaint, as my complaint was not valid under the Act. The Court has not ruled that the HCCC does not have jurisdiction; it does. The Court did not rule that the findings of the HCCC investigation are incorrect; they are. I’m happy to correct my mistakes when I find out I was wrong.